Following on from consultations with representatives of The Alliance of Retired Public Servants, of which ARCO is a member, the Government has announced an easing in Public Service Pension Reductions. The full statement on the matter from the Minister for Public Expenditure and Reform may be read here. The following are some dates-for-your-diary. Details of these events will either be posted on this website or will be available locally closer to their dates. Members are encouraged to attend the National Day of Commemoration at the Royal Hospital Kilmainham on Sunday, 12 July. Throughout the coming summer a Ceremonial Military Guard will parade at the site of the 'National Memorial to Members of the Defence Forces who died in the Service of the State’. Ceremonies will take place at Archbishop Ryan Park, Merrion Square, Dublin, every Saturday, from 18 July to 22 August. The ceremony will begin at midday and will last for approximately one hour. Units from throughout the Defence Forces and across the Army, Air Corps and Naval Service will participate in this Military Guard Ceremony in solemn remembrance of their fallen comrades. The Defence Forces Veterans’ Day will take place in Collins Barracks, Cork on Saturday, 12 September. The ARCO AGM will be held on Friday, 2nd October in McKee Barracks, Dublin. The Annual Carol Service will take place on Wednesday, 9 December and has proven to be a very popular event with our members. Watch out for the dates and details of The Defence Forces Annual Gala Concerts: these are held in Dublin (The National Concert Hall) in the Defence Forces Training Centre (St. Brigid’s Garrison Church) and in Cork (The City Hall). ARCO regrets to inform its members of the death of Lieutenant Colonel Patrick A. (Tony) Kelly, late of Calverstown, County Kildare and of the Corps of Engineers, McKee Barracks, Dublin. On 3rd June 2015 (peacefully) after a short illness. Beloved husband of Carmel. Predeceased by his father Paddy. Sadly missed by his loving family, his mother Maeve, sisters Helen, Bernadette, Muriel, Ruth and Rachel, brothers David and Brian, brothers-in-law, sisters-in-law, nieces, nephews, relatives, colleagues in the Defence Forces and friends. Removal on Friday evening from Fanagans Funeral Home, Kimmage, to St. Colmcille’s Church, Knocklyon, arriving at 5pm. Funeral Mass on Saturday morning at 11am followed by burial in Mount Venus Cemetery. Family flowers only please. Donations, if desired, to the Irish Cancer Society. ARCO Members can now avail of the latest RACO phone offer provided they were members of RACO upon retirement or upon promotion to a rank not represented by RACO. An ARCO member purchases a new phone or upgrades their Vodafone contract in a Vodafone shop or online. When s/he has a contract in place with Vodafone, s/he can use the Word Document HERE to provide their details to ARCO. To do this the form should be filled out electronically and saved to a computer. When completing the form ARCO members should enter 'ARCO' for the 'Company Name' and use their Defence Force number as the ‘ARCO Number'. ARCO will confirm eligibility with RACO. 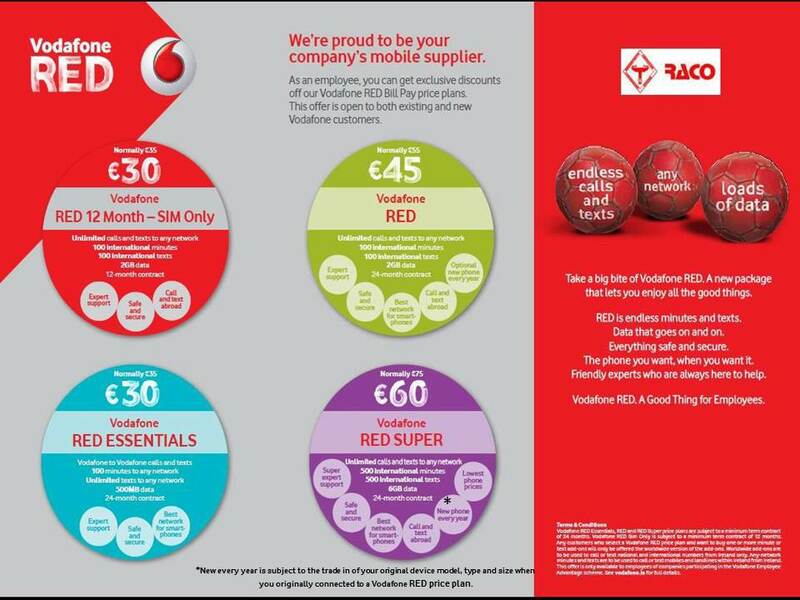 On confirmation of eligibility from RACO Vodafone will apply the 20% discount to the account and member should see the discount on their next bill. Details of the savings are available HERE.